I look to help you identify your strengths and utilize them so that you can achieve your desired outcomes. My approach is to utilize multidimensional psychodynamic tools based upon your life course and inherent difficulties. In conjunction with the client, goals will be developed and guidance will be provided in order to achieve the optimal short term gains and long term growth. I primarily utilize cognitive behavioral therapy, social learning theory and task based theory to help achieve change. These tools can be particularly helpful for those coping with negative thought patterns, depression, anxiety, developmental differences, executive functioning difficulties and challenges associated with trauma and transitions. My practice has entailed work with a wide variety of individuals including teens and young adults with learning, emotional, and developmental differences. I have also engaged in practice with individuals with autism, those impacted by a wide range of environmental challenges as well as those having difficulty making life transitions. I have also participated in family based crisis management, helped families develop a range of techniques to improve relationships with their significant others and acted as a conduit between family members coping with trauma. I live with my wife, daughters and two dogs and have a passion for helping others. I look forward to getting to know you and helping you have your aspirations align with your actions! I had my first session with Mike and I was impressed at his intellect and listening skills. He has a good comfortable vibe about him that makes you feel you can say anything you need to say without shame or judgement. I'd recommend him highly. I've had him as a counselor for about a week he answers texts in a timely fashion as well. I worked with Mike to get over issues of anxiety that I had been dealing with and I must say that he was a tremendous help who helped me get into a far better place than I was in when I started. He was a true gentleman to work with and always kept my requests and needs in mind, helping me reach conclusions that I could not have come to without him. Mike is a great counselor and anyone is lucky to work with him! Thanks so much! I have never had therapy before. I knew that I needed it from a long time ago. When my mother passed away, I was triggered and became depressed. I knew that I had to get some help to cope with a lot of emotional pain and grieving. Mike really got me through the funeral and its aftermath. I am glad that Mike is counseling me again, it has been very helpful. I can always tell when it's time for me to have a session. I would highly recommend Mike. I've had Mike for awhile now and he has been really great in giving me a space where my feelings are validated as well as helping me with cognitive exercises for my cognitive impairment. I am a better person as a result of having him as my therapist. Mike sticks to the point and conveys his ideas clearly. Mike has been a cornerstone in my mental transformation and I have immediately seen the difference and positivity in my life. I am extremely thankful for Mike’s partnership and guidance. Mike has helped me though so much.. I've suffered with depression and anxiety for 15+ years and had numerous therapists. Mike is the only therapist I would recommend. He is supportive, but doesn't coddle you and really works with you through your issues rather than tell you what you're doing wrong. He is truly a blessing in my life and I can honestly say that I don't know if I'd be here if I hadn't been matched with him. Mike, if you read this....thank you, from the bottom of my heart. You are truly an angel. Mike is an extremely open minded person who listens to what’s on your mind and tries to make certain situations relatable. He is very keen on figuring out what your concerns are and how to best approach the situation together or through best practices individually. He’s been extraordinarily helpful! Mike is a good listener and is very respectful in the way he communicates his insights. Mike is very good at helping me break down the components of my problems and my emotional reactions to them. I'm an analytical person by nature so I really appreciate this quality in a therapist. I am really happy to have been paired up with Mike. I feel that I can open up to him about anything and he isn't judging and tries to give the best advice as well as asking questions to get you to really think about certain things and try to figure things out. Anything that I talk to him about, he addresses everything. I really like that he asks questions and when he responds back, it isn't just a few short words here and there. You can tell he really is taking the time to reply back and help as much as he can. I trust him enough to open up to him about everything that I need and want to talk about. Mike Pfisterer is a gentleman and a true professional. He takes in all the thoughts and feelings I write to him and addresses every single one. He also makes it even more helpful by making suggested references to other professionals who are experts in their field. I believe that Mike is truly taking every case he has and making it individualized to what the client requires in order to get the best results and just to help. I trust in his abilities and feel very confident in disclosing my thoughts with him. Thanks Mike. I'm really glad I got paired with Mike when I joined BetterHelp. The tools he's given me to manage stress have been very helpful and I will continue to use them. He has been very encouraging and kind and gives me thoughtful responses which I always look forward to reading. 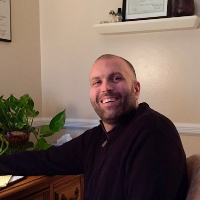 If you're looking for a compassionate and supportive counselor, you can't go wrong with Mike. Mike has been super attentive and consistent in his support. He asks good questions and spends time responding in a caring and clear way. I've really enjoyed my sessions with him so far and highly recommend him! Would you like to write a review for Mike Pfisterer? We'd appreciate if you can spend a couple of minutes to write a short review for Mike Pfisterer (LCSW). This review would be shared with Mike Pfisterer. It may also be posted in our website or in Mike Pfisterer's profile but it would be anonymous and your identity would be kept completely confidential.